Lovers of vintage perfumes know how painful it is to look at the drying drops of a rare and hard to find fragrance, how many nervous cells are lost when one is waiting for a special occasion to wear such a fragrance. 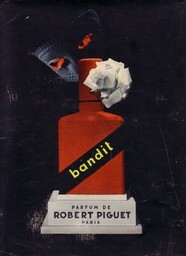 I managed to make a couple of drops of Bandit parfum circa 1948 last a couple of years. Let them leave behind not just memories but also words. Bandit is a leather trench coat in a field of sagebrush. The skin, which hasn’t known sun or wind for months, smells of “French perfume”. Every stage of the fragrance’s development comes as a wave. First, hesperidic, blindingly sunny, and yet soft like a touch of a palm. My legs get weak when the wave of sagebrush comes. The peak is reached. Everything that comes after (rose-jasmine-ylang, especially ylang!, leather) is no less beautiful but already doesn’t matter. Bandit circa 1999 is an entirely different scent. I tried to wear both at the same time, for comparison, but abandoned the idea. Next to its predecessor, the modern Bandit is old-fashioned and prim, which is not true of the vintage. I find it hard to even understand, why it is considered a chypre. Perhaps, in parfum, the aroma displays chypre quality, but in EDP it is a cold, aloof floral composition on a dry leathery base. I love it, but I am not crazy about it. To the contrary, Bandit is a great fragrance to wear to work. It’s like an inner boss, dispassionately reminding about the approaching deadline. The hesperides in the top notes are sharp and sour, to the point of tooth ache. Neroli? No, an unripe lemon. In its heart (does it even have a heart?) there are cold, biting flowers, jasmine and ylang. It smells slightly salty, a little bit subterranean. The leather in Bandin is black, dry and hard, like an old briefcase which hasn’t been take care of in ages. With this Bandit, it is important not to overdo it. It won’t let you relax, even when you think that you’ve done enough. That is why I never apply it behind my ears, only on my wrists. I still hope that, in parfum, the contemporary Bandit will be able to carry not only a briefcase with papers but also a leather trench coat, because in modern fragrances, parfum is the form that is the truest to the composition. Любители винтажных ароматов знают, как больно смотреть на высыхающие капли редкого и малодоступного аромата, как расстрачиваются остатки нервов в ожидании особого случая, чтобы позволить себе их надеть. Пару капель винтажного Бандита в духах 1948 года я умудрилась растянуть на несколько лет. Пусть от них у меня останутся не только воспоминания, но и слова. Bandit – это черный кожаный плащ среди полынной степи. От кожи aka skin, долгие месяцы не знавшей ни солнца, ни ветра, пахнет “французскими духами”. Свет, горечь и тепло тела. Каждая стадия аромата накатывает волнами. Сначала гесперидная, ослепительно-солнечная, и при этом мягкая, как прикосновение ладони. Подкашиваются ноги, слабеют колени – это пришла полынная волна. Высота взята. Все, что наступает потом (роза-жасмин-иланг, особенно иланг!, кожа aka leather), не менее прекрасно, но уже не имеет никакого значения.